"Jeopardy!" champs Ken Jennings, left, and Brad Rutter match wits with IBM's computer Watson on the popular game show. (CNN) -- Start the "computers are conquering the world" jokes now. "Jeopardy!" master Ken Jennings already has. The IBM supercomputer Watson won its second "Jeopardy!" game in Wednesday's edition of the TV show, completing a sweep of its two human opponents, including Jennings, who acknowledged mankind's trivia inferiority before the match was even over. "I for one welcome our new computer overlords," Jennings wrote under his correct Final Jeopardy! solution, prompting laughter from the studio audience. Watson -- despite being far from perfect -- was too far ahead in the two-game match to be caught. It beat Jennings and fellow "Jeopardy!" champion Brad Rutter, earning $41,413 for the day and $77,147 for the two-game total. Jennings, who led for a good portion of the second game before succumbing to a late string of correct Watson answers, ended the game ($19,200) and match ($24,000) in second place. 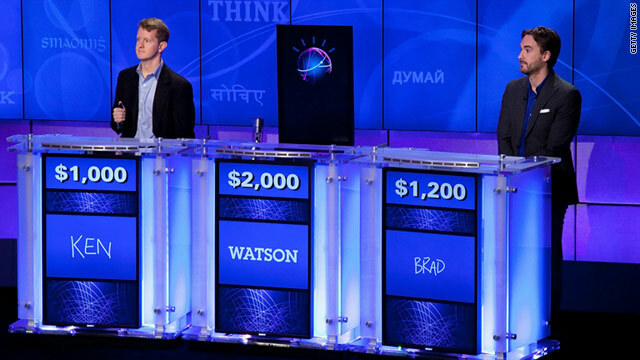 The "IBM Challenge" match was spread over three days, with the first game taking two days so that host Alex Trebek could take time explaining what Watson is. A massive machine represented at the studio by a tablet-like avatar, Watson was in development for years and has the processing power of 2,800 "powerful computers." IBM trumpets Watson as a machine that can rival a human's ability to answer questions posed in natural human language. For the games, the computer -- stored in a separate building in New York -- received clues through digital texts and buzzed in against the two other contestants like any other player would. Watson was often quicker to the draw than its opponents and usually correct when it was. It breezed through clues relating to geographic nicknames ("Coyote State" is an unofficial nickname of South Dakota, Watson knew) and legal terms ("esquire" is a title added to the name of American attorneys). But Watson stumbled, too. One of its most curious errors happened during a Daily Double. The category was nonfiction. Clue: "The New Yorker's 1959 review of this said in its brevity and clarity, it is 'unlike most such manuals, a book as well as a tool.' "
The correct response (always given in a form of a question, because the clue is technically an answer) would have been "What is 'Elements of Style?' " Watson, however, responded not with the name of a publication, but a person, Dorothy Parker, who indeed wrote some opinions about "Elements of Style" but was not anywhere near what Trebek was looking for. Watson still came out the winner, earning a $1 million prize. IBM said it would donate all of Watson's winnings to charity. As runner-up, Jennings received $300,000. Rutter won the $200,000 third-place prize; both human contestants said they would donate half their winnings to charity. Rutter, who entered the final game in second place, finished last on Wednesday's show ($11,200) and for the match ($21,600). Jennings, of Seattle, shot to "Jeopardy!" fame for winning the most consecutive games (74). Rutter, of Los Angeles, won the highest cumulative amount ever by a single "Jeopardy!" player ($3,255,102) when including special tournament appearances. CNN's John D. Sutter and Brandon Griggs contributed to this report.